Last Saturday morning, the Oak Street Plaza’s giant wall at the entrance of the Oakland Museum of California (OMCA) was entirely black. 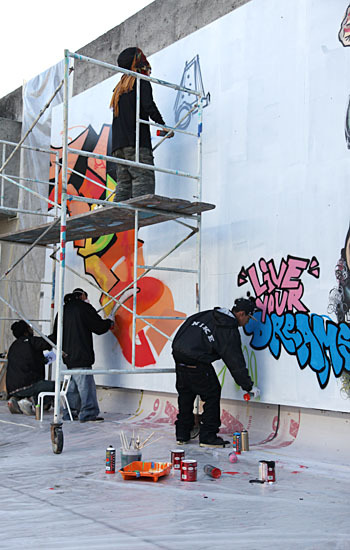 Four artists — Ras Terms, Safety First, Tecka, and Resta — were just arriving on the site to prep the space for the project “Living Concrete.” Paints were mixed, the wall whitewashed and spray cans opened. Let the art begin. As the artists started painting, music emanated from the turntables of three live DJs and the smell of Homeroom’s mac and cheese saturated the air. Watching the artists scale the 520-square-foot wall and transform it into a massive, graffiti-filled mural, visitors could join in the creative atmosphere. The project brought two Oakland street art titans — Ras Terms and Safety First — together with Tecka and Resta, two younger artists (Resta is only 13) just hitting the scene. Each came to the wall with his own style and contributions to the mural. A joint project between The Oakland Standard (an organization that initiates experimental projects in contemporary art produced by the OMCA) and Rock Paper Scissors Collective (a community-based art organization in Oakland), “Living Concrete” was an effort to bridge the gap between different generations of graffiti artists, or “street fine artists,” a term used by Ras Terms. Although all working together, Ras Terms and Safety First were showing the ropes to their younger counterparts. “It’s cool to show kids that they can get money from art and for doing what you really want to do,” said Safety First in his quiet, cool demeanor as he took a brief break from painting a colorful Native American woman in the bottom corner. The artists were working on a black panther woman, South American protesters, Oakland’s Tribune Tower and blocked graffiti lettering that read “Living Concrete” as the main features. All the characters and elements were layered on in bold electric colors that reflected the urban feel of the event. Despite a preplanned blueprint, the artists added their trademarks, weaving them into the composition and filling all negative space. Other notable Oakland street artists like GATS made their appearances at the event and contributed to the wall. Early in the day, Dan Fontes, a prominent old-school Oakland muralist and friend of Kristi Holohan (of Rock Paper Scissors) arrived at the museum to check out the project. Fontes is widely recognized for his larger-than-life giraffes (and zebras and turtles) that have walked the walls of Oakland since the ’80s. The four-artist crew met Fontes for the first time on Saturday, and invited him to paint one of his giraffes on the wall, adding yet a third generation of street artists to the project.